Francis Olson joined the Navy in June, 1942, as a Gunnersmate and was sent to Philadelphia to commission the U.S.S. Cleveland. He was onboard 18 months, which included the landing at Casablanca, a trip through the Panama Canal, and on to the South Pacific. He then spent some time on an Aircraft Rescue Boat, Tarawa. From there he was sent to Seattle for new construction on the Freestone, a Destroyer. The Freestone saw action at Okinawa and on to the end of the war. He then spent 8 months on the U.S.S. Hanson for duty off of China, and then spent 2 years assigned to the inactive fleet in Bayonne, N.J. In 1951, he was assigned to the U.S.S. Kimberly, a Destroyer that saw action in Korea, until it was decommissioned in 1954. Following two years on the U.S.S. Roberts, another Destroyer, Francis got every sailor's dream . . . putting the Aircraft Carrier, U.S.S. Saratoga, into commission. In February, 1957, he went on to Ohio State University for 3 years as Tech Assistant to the Freshman Instructor for the NROTC Program. 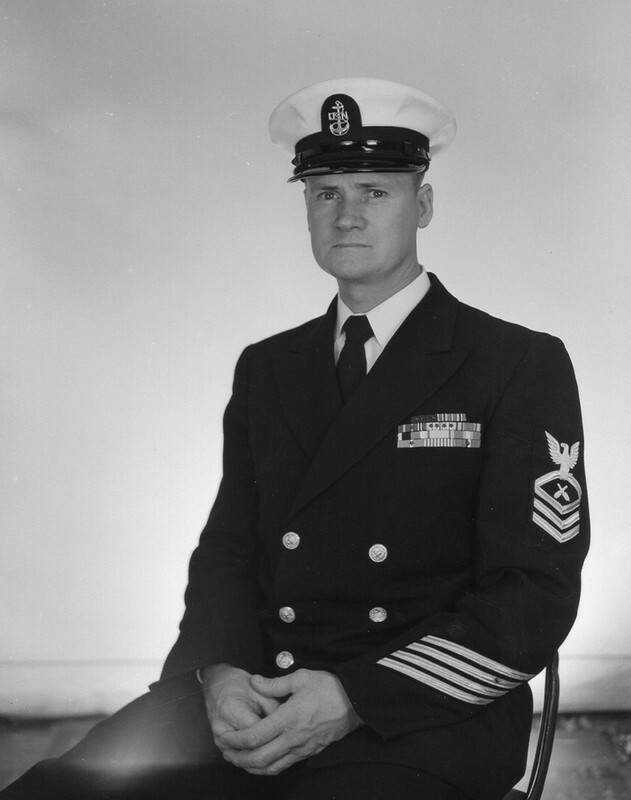 In 1960, near the end of his 20 years of service with the U. S. Navy, Francis Olson and his wife and family moved to Lakewood, CA, where Francis served out of the Long Beach shipyard. Looking at a future 6-month deployment, Francis just couldn't leave his wife, Anne, home along with 4 children for that length of time, and so he decided that his 20 years in the Navy were enough. In 1962, he retired from the Navy. After his years of service they moved back east but eventually returned to Lakewood and lived there until his passing in 2017. Francis absolutely loved the Navy and always had stories to tell, even to his final days.